How can social change organisations influence companies to do the right thing for the environment? One way is to influence the people and organisations who invest in them. For example, Rainforest Foundation Norway (RFN) has successfully made the world’s largest sovereign wealth fund, Norway’s Government Pension Fund Global (GPFG), adopt tropical deforestation as a priority issue in reducing climate change risk. Big shareholders like the GPFG are uniquely placed to reduce forest destruction by exerting influence on the companies they invest in. But what kinds of information are investors most likely to respond to? To find out, we partnered with RFN to investigate how civil society organisations can target their advocacy towards investors. We interviewed 30 people involved in socially responsible investment (investing in companies that operate sustainably and ethically), who worked in a range of countries and types of organisation. Most said that they were actively looking for civil society organisations to provide more high-quality information about companies’ activities. explains how socially responsible investors find and use information about rainforests. describes how investors can affect companies’ actions. suggests ways that civil society organisations can collect and use data in a way that reaches more investors, financial analysts and information providers – potentially significantly increasing their impact. Here’s an extract from the report explaining how the process usually works – check out the full guide for more. 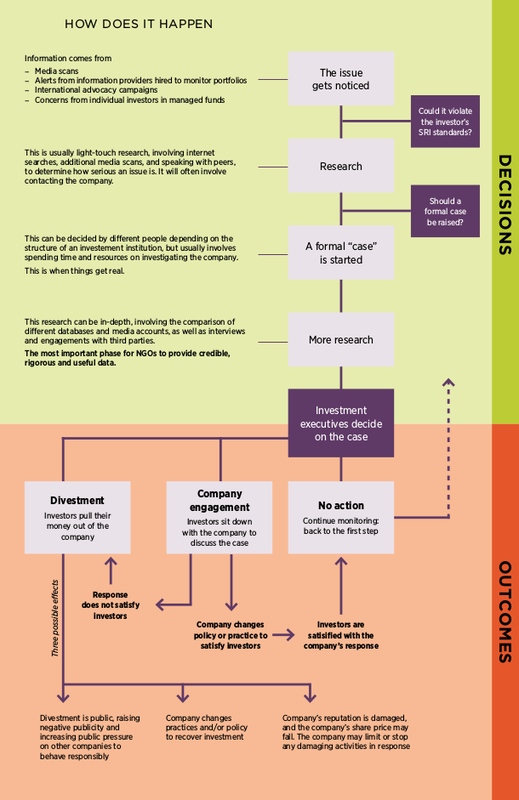 A flow-chart setting out the SRI decision-making process. The guide is part of our ongoing work to support environmental organisations to better use data and technology to monitor deforestation, forest degradation, and indigenous peoples’ rights. Watch this space for more in the coming weeks.